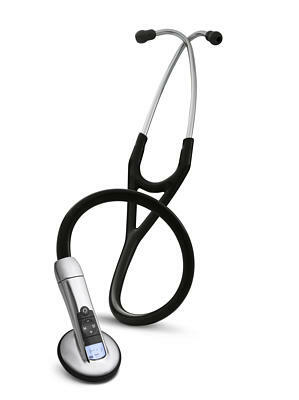 Littmann 3200 Electronic Stethoscope BLACK 27"
The most affordable Littmann Stethoscope prices online. NO HIDDEN SHIPPING FEES! Powerful Capability. Incredible Simplicity. Redefining what a stethoscope can do for you. State-of-the-art sound sensor. Proprietary Ambient Noise Reduction (ANR) technology reduces on average 85% of unwanted background noise. Amplification capability when sounds are soft. Clinical evidence shows it’s easier to detect difficult-to-hear heart sounds like S3 gallops, aortic regurgitation murmurs, as well as abnormal lung sounds. It all adds up to an exceptional listening experience - compared to acoustic scopes. Capture a sound for later playback. Helpful when seeking a peer opinion or when you are writing up notes on your patient’s condition, after your patient has left. Bluetooth® technology lets you transmit sounds real-time to your PC, which can then be further analyzed, attached to medical records, or reviewed online with colleagues. Use available Zargis® Cardioscan™ software to help you detect and classify suspected heart murmurs while with your patient. Or visualize heart and lung sounds using Zargis® StethAssist™ software, included free with every 3M™ Littmann® Electronic Stethoscope Model 3200. Two great tools that can enhance the auscultation process and help you hone your skills. Copyright StethStore.com - FREE Shipping...ALWAYS!. All Rights Reserved. eCommerce Software by 3dcart.